Don’t confuse this woodpecker, with its ravishing red head, for anything but the Red-bellied Woodpecker (Melanerpes carolinus). 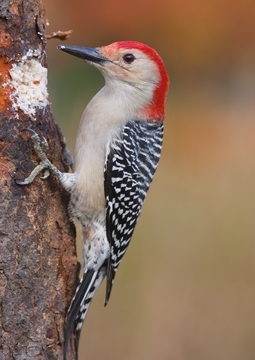 While it may not be the most noticeable feature, its belly is indeed patched with rouge (besides, “Red-headed Woodpecker” had already been taken). Common throughout the eastern United States, this species can often be found halfway up a tree—especially in oaks, hickories, or pines—picking apart the bark to find a hearty meal.